Even if you're handy under the hood, it's hard to keep track of all the auto maintenance services your vehicle needs to continue to perform. Belts and hoses are among the most integral parts of your vehicle's engine and failure in any of areas can cause multiple issues. If a belt snaps or a hose leaks, your engine could stop working or worse, it could be badly damaged. Belt and hose damage accelerates and even causes deterioration that leads to other mechanical failures. 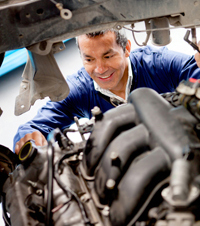 Follow this advice to avoid unnecessary auto repairs. Coolant and heater hose inspection should be performed regularly. Hoses are made from flexible rubber to absorb vibrations between the radiator and the motor. They're prone to damage by way of dirt, oil, sludge and extremes temperatures. When checking hoses for wear, look for cracks around the bends as well as bulges, splits and fraying. Use your sense of touch to feel the hose for irregularities or inconsistencies. Wait until the engine has completely cooled down, then gently squeeze the length of the hose to feel for brittle or mushy spots. A good hose will be firm yet slightly pliable. Most mechanics recommend hose replacement every four years, but specific recommendations for your vehicle can be found in your owner's manual. It's also recommended that you replace all hoses when one fails. Accessory belt damage can occur in a similar manner as hose damage. Many modern automobiles feature a grooved belt that drives the AC compressor, power steering, water pump and alternator. Modern belts are usually more durable than those in older vehicles, but regular belt inspections are necessary despite the age of your vehicle. Start your belt inspection by checking for splits, fraying and cracks. Check the top cover for signs of glazing, as glazed belts are known to be vulnerable and experience premature wear from high temperatures. Not all hose and belt damage can be checked for with a quick visual inspection, which is why it's essential an expert mechanic assess the condition of your engine's working parts. For your next auto repair, oil change or regular auto maintenance service, call Hye-Tech Auto in Covina at (626) 332-5452 today, and remember to mention one of our money-saving online special offers.